Brilliant color. Unprecedented detail. Breathtaking depth. Introducing the VIP series, cutting-edge HD receivers and DVRs capable of delivering the most HD content in the industry. 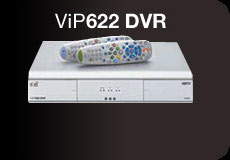 The ViP622 DVR™ HD receiver is cutting-edge TV sophistication with a digital video recorder and high-definition receiver that supports two TVs. It’s another example of DISH Network setting the standard for better TV.